You can of course buy sausage rolls but in my opinion homemade sausage rolls taste SO much better! They are super easy to make yourself and perfect to take along to any New Year party or buffet. It is a tradition of ours that I make them every Christmas and this year Jack helped in the kitchen. A 5 year old is more than capable of making an egg wash and brushing the pastry. 1 - Take the pastry out of the fridge and packaging (to allow it to reach room temperature) for 10 mins, pre-heat your oven to 180 degrees and grease your baking tray. 2 - Cut your pastry in half lengthways into two strips and place half of the sausage meat down the centre of each strip. 3 - Bring both sides of the pastry up to cover the sausage meat and use wet fingers to mould the join in the pastry so it is seam-free. 4 - Cut each strip into 12 equal sausage rolls and place on your baking tray. At this stage you can freeze the sausage rolls on the baking tray and then transfer to a freezer bag once frozen. To cook from frozen repeat step 5 but bake for 40 minutes rather than 30. 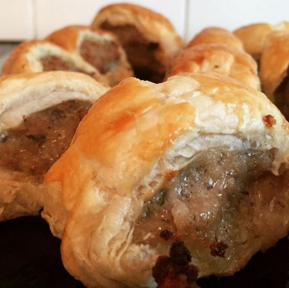 5 - Beat an egg and generously cover all of the pastry on the sausage rolls. Bake for 30 minutes and enjoy warm. Do you have a fall back party recipe you use every year? These look incredible and so easy to make. Shame I can't taste test one for you. :).